Bezel setting tools will speed up the setting process! Using calibrated stones and tube bezels, you’ll be amazed at how quickly you can finish your settings by just adding a bezel setting tool to the equation. They are a hot seller at Halstead among customers because of their ease of use and they’re truly a time saver. These tools are highly polished so they won’t scratch or chip your stones plus they will not damage the rim of the tube bezels. They’re made from tempered hardened steel so they last for a long time. To set your stone, place the calibrated stone into the tube bezel, being certain it’s laying flush (this is the most important step of all, make sure your stone is flush). Next, place the bezel setting tool (be sure it is straight up and down) over the stone and the rim of the tube bezel. Lightly strike the top of the bezel setting tool once or twice to set the stone. Practice until you’re familiar with this jewelry tool and the strike of the hammer before setting a stone into a jewelry piece. If you’re familiar with production work, this will speed up the process greatly. Line your tube bezels in a row, place your calibrated stones on the seat, use your hammer and go down the row lightly striking each tube bezel as you go. What a time saver! A few strikes and you’re finished. If you make chain settings, our chain setting block will quicken that process, too. These tools eliminate the need to use bezel rollers and burnishers. One to two strikes and you can move onto the next project. The bezel setting tools come in 3, 4, 5 and 6mm and they can be found on the Halstead website along with an array of calibrated loose stones. 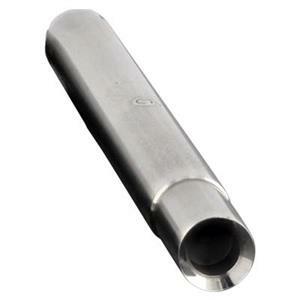 These are a great addition to any jewelry studio that sets calibrated stones into tube bezels. Notes: Overall dimensions: .25x3in. This tube bezel setting tool has a tight fit. Please make sure its centered, on top of the tube bezel, before striking it with your hammer. this are very finely and precision made tools. they work beautifully and are the only ones i use. well worth the price! Had used one in a recent class, instructor recommends this tool from Halsted . So I ordered a 4mm and a 6mm.. Have used both and I am pleased at how easy they are to use. This bezel setting tool is amazing. Would like to have another in a 4mm. Used it on several settings and all come out perfectly.